Becoming one of America’s most recognized artists is the dream of many, but most often remains merely a dream – rarely does it become a reality. Dale Chihuly made it to the top, but the journey getting there was not always an easy one. Chihuly was a student of interior design and architecture in the early 1960s. By 1965, he had become captivated by the art of blowing glass. He enrolled in the hot glass program offered by the University of Wisconsin. The program was founded by Harvey Littleton; the father of the Contemporary Studio Movement in America. In 1968, Chihuly was awarded a Fulbright grant to study glassblowing in Murano, Venice. 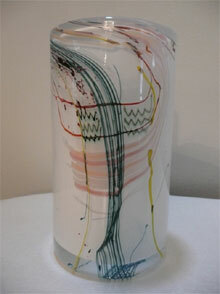 It is often said his inspiration for his glass designs came from his experiences there. After Venice, he traveled to see the Libenskys in Czechoslovakia. Their workshop was known for their heavy cast glass sculptures. From there he went to Germany to visit one of his favorite glass artists, Erwin Eisch. 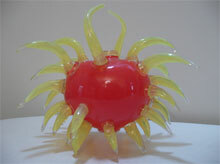 Chihuly received a degree in sculpture, and then entered the ceramics program at the Rhode Island School of Design. It was there Chihuly founded the schools glass program which has produced numerous recognized artists. Chihuly didn’t stop there. He co-founded the Pilchuck School in Washington in 1971. The Pilchuck School has brought together artists worldwide into the program. It has also helped place the area on the map as a mecca for contemporary artists. In the fall of 1975, Chihuly was scheduled to lecture at a University in Ireland when tragedy struck. He was in an automobile accident that took one of his eyes. This could have been the end of a career for most artists; but not Chihuly. With the struggles of losing his depth perception, came new collaborations. He now was less tied to the actual blowing of the glass, and could spend more of his efforts drawing and photographing his latest creations. In 1978, Chihuly was offered a solo show at Renwick Gallery (part of The Smithsonian Institution in Washington, D.C.) This was a huge career move for Chihuly. Since that time, Chihuly’s works have traveled to museums all over the world. Documentaries about his life and his works air regularly on PBS. His dream of blowing glass had made the move from the Rhode Island School of Design, to Chihuly Inc, a multi-million dollar a year company creating glass for corporation, museums, and collectors worldwide.